Thousands of people turned out in Hong Kong to mark the 26th anniversary of the Tiananmen Square protests. (TibetanReview.net, Jun06, 2015) – On the 26th anniversary of the Chinese government’s army massacre of peaceful student-led demonstrators on the Tiananmen Square in Beijing, the United States has on Jun 4 again urged the Chinese leadership to take steps to improve the human rights condition of its people, in particular ethnic and religious minorities including Tibetans. “Twenty six years after the Chinese government’s violent suppression of peaceful protests in and around Tiananmen Square on June 4, 1989, the United States continues to call for an official accounting of the victims of these events, the release of those still serving Tiananmen-related sentences, and an end to the harassment and detention of those who wish to peacefully commemorate the anniversary,” PTI news agency Jun 4 quoted State Department spokesman John Kirby as saying. Kirby has noted that a number of pending legislations in China appeared to actually worsen the human rights situation there. “We are closely monitoring developments with respect to pending legislation in China relating to national security, counterterrorism, and the regulation of NGOs that appears to call into question China’s commitment to increased openness and could, if enacted in current form, result in rights abuses,” he was quoted as saying. To this day it remains unclear whether the mostly student peaceful protesters killed by the Chinese PLA troops, using tanks and other lethal arms, on Jun 4, 1989 ran into hundreds or thousands. Democratic Leader Nancy Pelosi has said the international community must continue to encourage the Chinese government to openly acknowledge the events of June 4th in classrooms and communities throughout each country. “Whether in Tiananmen Square or in Tibet, the US Congress must continue to confront human rights abuses wherever they occur,” the House Minority Leader was quoted as saying. The Chinese government has long reiterated that a conclusion had been reached for what it calls a “political glitch” and never admitted wrongdoing in the massacre that was witnessed by the world. It insists that the strong economic growth in the following decades is proof that it chose the right path of development. While marking the anniversary or even talking about it is taboo in mainland China, tens of thousands of people in the Special Administrative Region of Hong Kong marked the anniversary with demonstrations. They gathered in parks and public spaces in Hong Kong to commemorate not only the 26th anniversary of the military crackdown on the 1989 democracy movement in China, but also the city’s own pro-democracy movement last year. 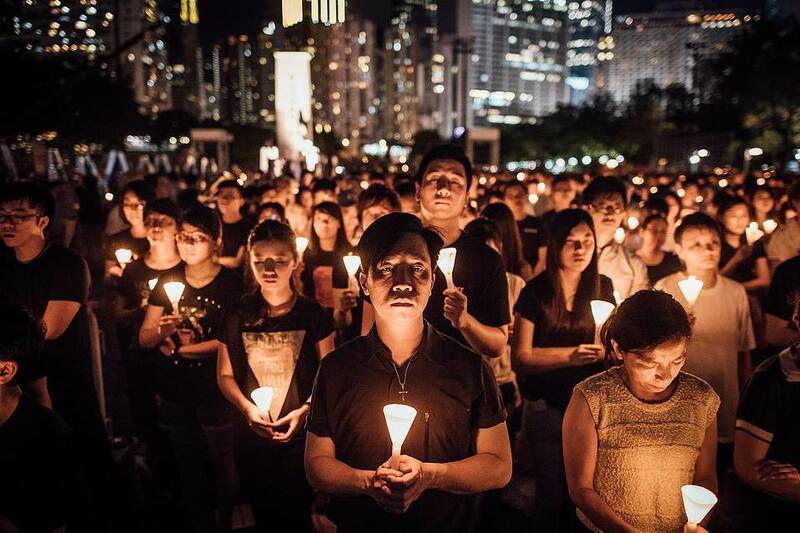 The crowds poured into Victoria Park amid the neon-clad skyscrapers of Causeway Bay for a mass candlelight vigil, filling up the space of six football fields, singing anthems of the 1989 movement, and bowing three times to remember those who died, reported Radio Free Asia (Washington) Jun 5. The event’s organizers hammered home the link between last year’s 79-day Umbrella Movement and the events of June 3-4, 1989, with this year’s slogan “Build a Democratic China,” the report said. However, for the first time since a million people turned out on Hong Kong’s streets in the immediate aftermath of the massacre, the city’s student federation boycotted the main event, while students and local activists held smaller events elsewhere, including on the waterfront at Tsimshatsui, the report said. Student unions of half of the territory’s eight universities declined to join the vigil or take part in a march held earlier in the week, reported japantimes.co.jp Jun 5. The Federation of Students, which led an occupation protest last year over Beijing’s meddling in Hong Kong politics, also for the first time dropped out from the annual events. They boycotted the main events to openly question Hong Kong’s role in helping to build democracy in China. This was a reflection of a societal division which emerged in last year’s Occupy Central protest movement between the older generation of activists who identify themselves as Chinese and the younger generation who sees themselves first as citizens of Hong Kong and therefore being concerned more about Hong Kong affairs.